Manufacturing process operation documentation is established to collecting information of each operation & materials proceeded in manufacturing processes. Manufacturing process operation documentation are prepared to monitoring on manufacturing processes and operations, controls for maintain quality of product during operations to collecting information of each manufacturing activities, process stages and operations which materials are being used and what is output of process operation is conducted, managed and information are analyze to determine action to controls over each processes for improvement of product quality and enhancement in manufacturing processes, machinery and equipment and manpower’s productivity in time frame. Manufacturing process operation documentation is also used as records for the analysis of process wise analysis and operational management, the document conducting each activity & movement of process that helps to determine actions for improvement in processes and identification of processes treats and its individual requirements, that can be in form of resources, manpower or any particular parameter setups. 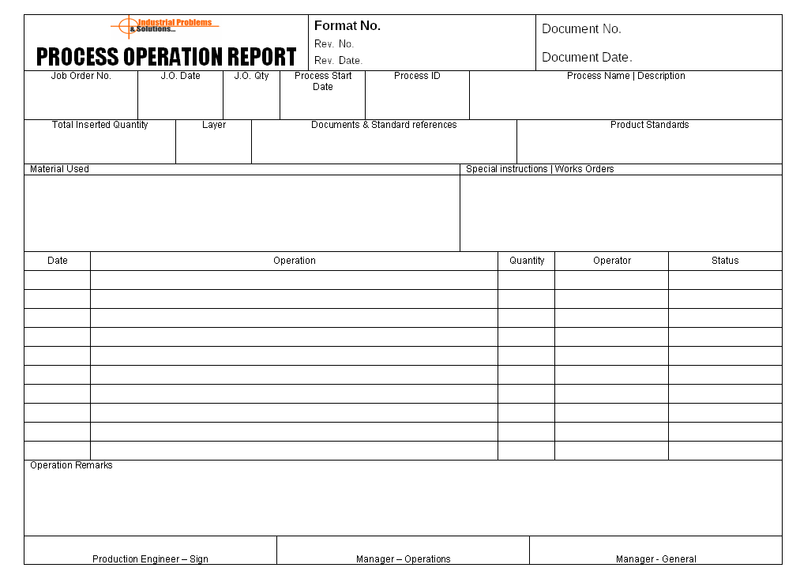 Manufacturing process operation report is prepared by department supervisor to record information which is collected during whole shift or day which all information about manufacturing processes, material which is inserted for producing, other materials which is supporting to manufacturing process ( Bill of materials), special instructions and other work instruction details on base of the whole manufacturing processes are conducted, process description and its required standards, product specifications, technical information for managing product quality and each stage of manufacturing processes / task are covered in the report to complete set of information help to analyze information, and determine actions for improvement and supporting other processes like planning, production setup and quality management. The records are handled by production department and each report is maintained and updated as per standard system deployed in management, the documents are storage and destroyed as per retention period.